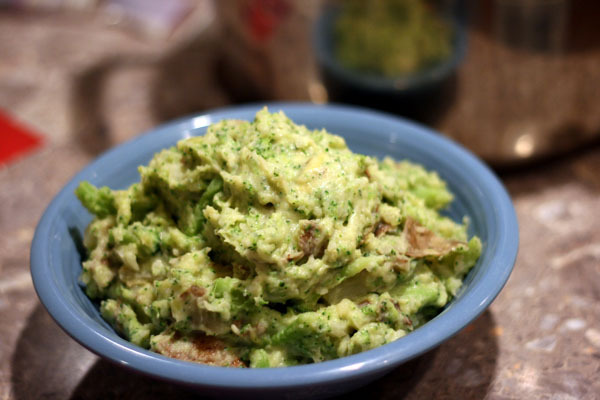 Broccoli Potato Mash is a great way to add in some extra vegetables to your family’s diet! This great side dish would go great with just about any dinner. I used Idaho potatoes for my Broccoli Potato Mash, but it would be delicious with any type. With delicious cheese mashed in, this Broccoli Potato Mash is sure to because a family favorite! Cut potatoes into 2 inch chunks and place in a large pot of water. Bring to a boil, reduce heat and simmer until almost done. Add broccoli florets to the water with the potatoes. Simmer until potatoes and broccoli are tender. Drain. Mash potatoes and broccoli together with the cheese and milk. Season to taste with salt and pepper.